By Jonathan G. Koomey, Ph.D. The world keeps getting more complex, but becoming a better problem solver can help you make sense of it all. Mastering the art of problem solving takes more than proficiency with basic calculations–it requires (among other things) understanding how people use information, recognizing the importance of ideology, learning the art of storytelling, and acknowledging the important distinction between facts and values. Turning Numbers into Knowledge is a compelling introductory guide to these and other essential skills. 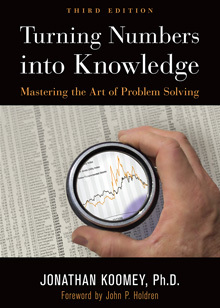 Full of tools, tricks, and tips for solving problems in the real world, it will prepare you well to make independent judgments about the numerical assertions of others and to generate cogent and compelling analyses of your own. The newly revised and updated third edition of this book teaches beginning analysts and students the art of using numbers for practical problem solving, revealing tools, tricks, and heretofore unwritten rules that the best real-world problem solvers know by heart. More than 34,000 copies of the 1st and 2nd editions in print! Turning Numbers into Knowledge won Next Generation Indie Book Awards in the Business and E-Book Non Fiction categories for 2018. Turning Numbers into Knowledge won Silver awards in the Business Non-Fiction and Professional/Technical Non-Fiction categories in the Global eBook Awards for 2018. Turning Numbers into Knowledge also won a Silver Medal in the 2018 eLit eBook awards, in the Business/Career/Sales category. Turning Numbers into Knowledge was a finalist in the 2018 International Book Awards in the Business:General category. Turning Numbers into Knowledge also got honorable mentions in the 2018 Hoffer Book Awards in the Business and Reference categories. "There is nothing else like this book out there. Nobody who deals with problems where numbers matter — and everybody in today’s world really needs to — should be without it." —John P. Holdren, Past President, American Association for the Advancement of Science and Former Chief Science Advisor to President Obama, from the Foreword. $24.95, 251 pages, 19 graphs, 19 tables, 10 diagrams, 12 cartoons, and 1 photo. Trim: 7x10". Publication date, 3rd edition: October 2017. Because of formatting issues with the Kindle app on iOS devices, we recommend that you read the Kindle version using Kindle previewer on Mac OS or using other Kindle devices, or go for the ePub version. We are working with Amazon to resolve those issues, but the book is graphically complicated and just won’t format properly in the current version of the Kindle app for iOS. The ePub version works just fine on iOS iBooks. Unless otherwise noted, all materials on this web site, including downloadable files, are licensed under a Creative Commons Attribution-NonCommercial-NoDerivatives 4.0 International License. Copyright © Jonathan G. Koomey 2018. Some Rights Reserved.